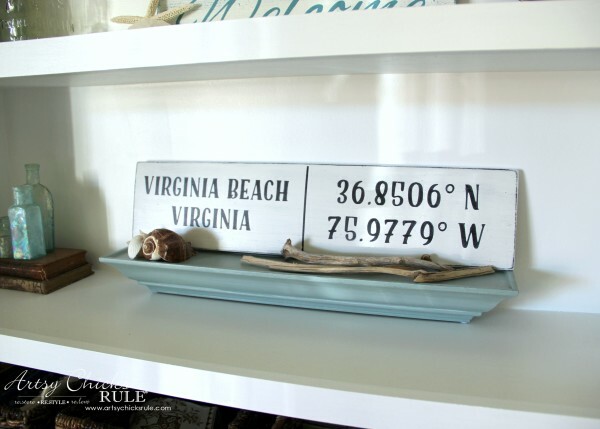 This DIY coordinates sign is perfect as a gift or even for your own home! 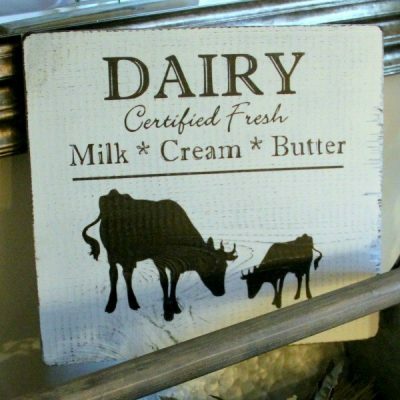 Today I thought I’d share a brand new sign with you. Yes, I know, I must really love signs! Today’s sign is kind of fun and was inspired by one I saw in Charleston, SC a few years ago. 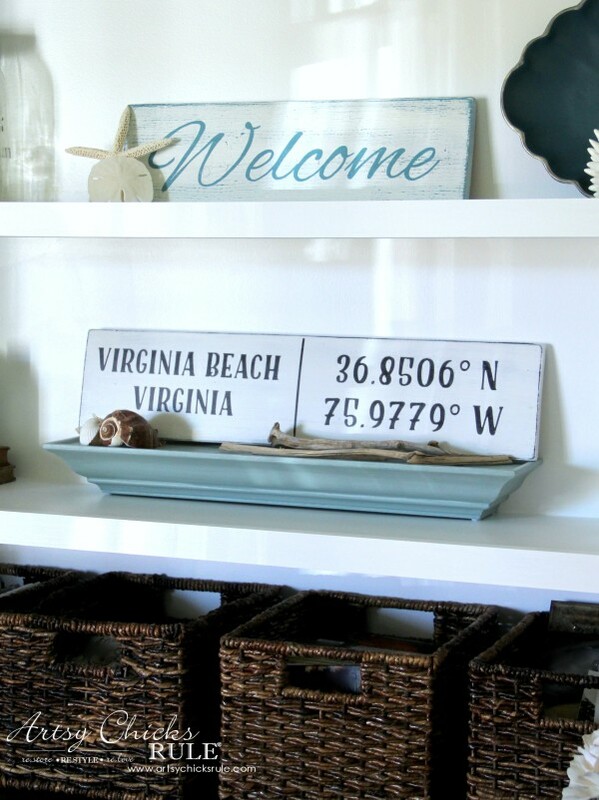 I’ve wanted to make one ever since….a DIY Coordinates Sign. I also have an announcement. I’m joining up with some other very lovely ladies to bring you a themed project each month! I’ll be sharing my own themed project along with them AND sharing a link party so you guys can join in too. OR if you are a reader, you can visit the party and see fun new projects gathered for you all in one place. The party is called “Get Your DIY On“. You may already be familiar with it. This was such a simple project, y’all. I did it using my Silhouette Cameo. I haven’t really used it often but I think that has all changed now! Ever since I realized I can move my own creations over into the program…well, it’s a game changer. 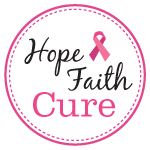 Affiliate links are provided below for the products I’ve used. See my full disclosure here. I found this old board in the garage that would be perfect for the sign. As you can see, I’ve already cut out my graphic. I created it in Picmonkey and transferred it over to my Silhouette to cut. Picmonkey is a super user friendly program I highly recommend. 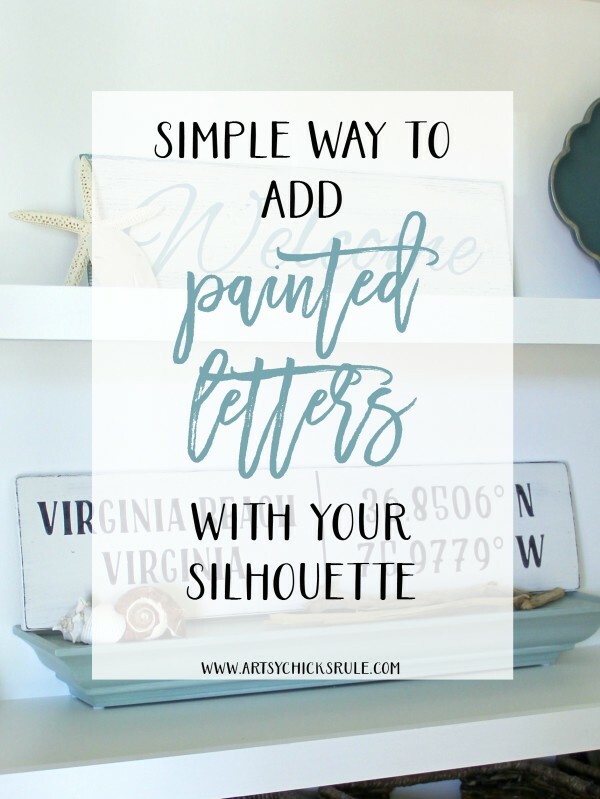 Want to see how easy it is to use your own designs inside of Silhouette? 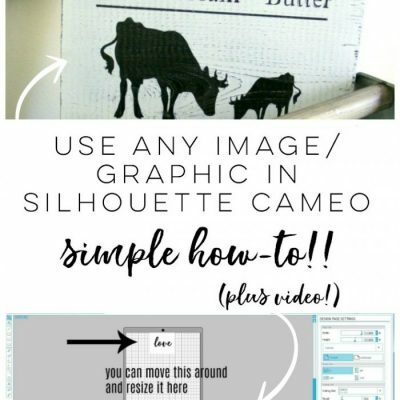 Click here >>> How To Import Your Own Designs Into Silhouette Cameo. 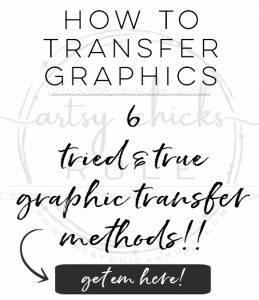 Or you can also use any of these transfer methods to do it if you don’t have a Silhouette machine. 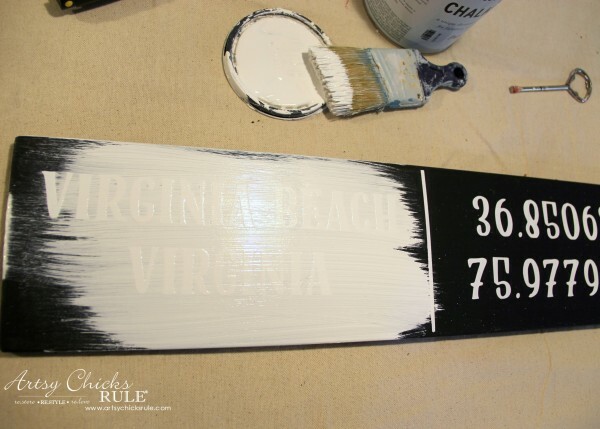 First, start by painting the board black. 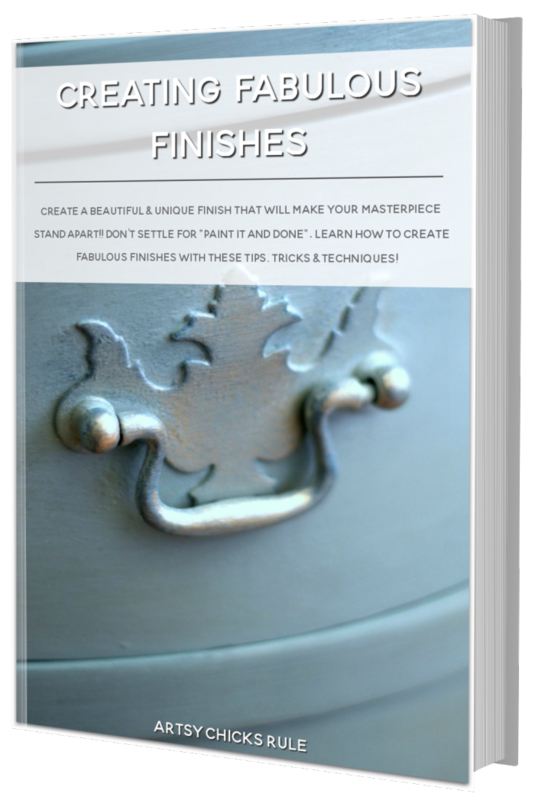 You can even use spray paint for this step. I used General Finishes Lamp Black. Next attach the vinyl lettering after you’ve cut it out and applied the transfer paper. Be sure to align it correctly. 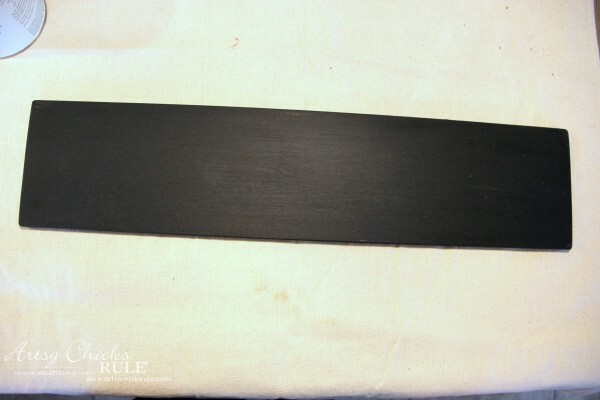 I always measure top and bottom of each side … plus side to side. 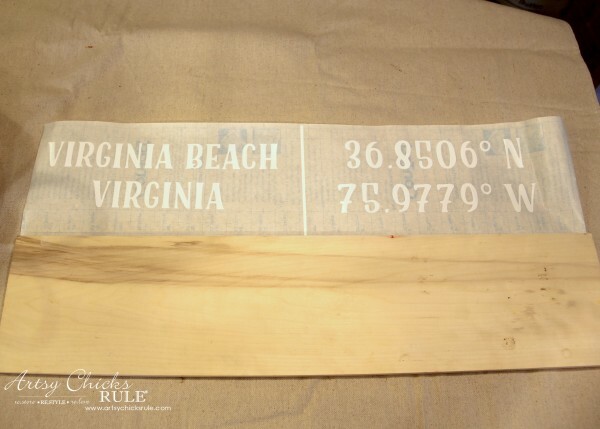 Rub it well to adhere the letters to the board and remove the transfer paper. This is what you are left with. Not bad and you could stop there. 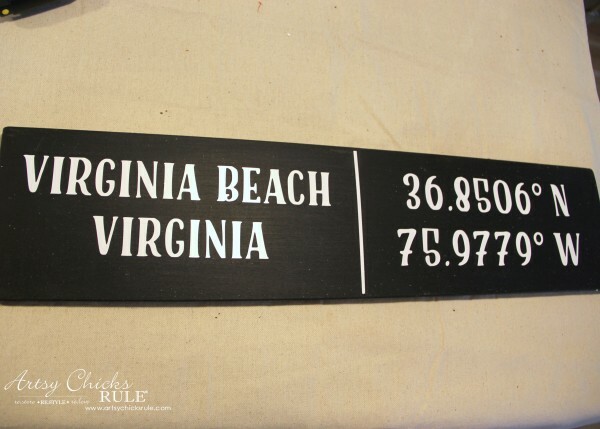 OR you could paint the board white and do the lettering in black vinyl and be done. BUT I wanted it painted with a worn look. 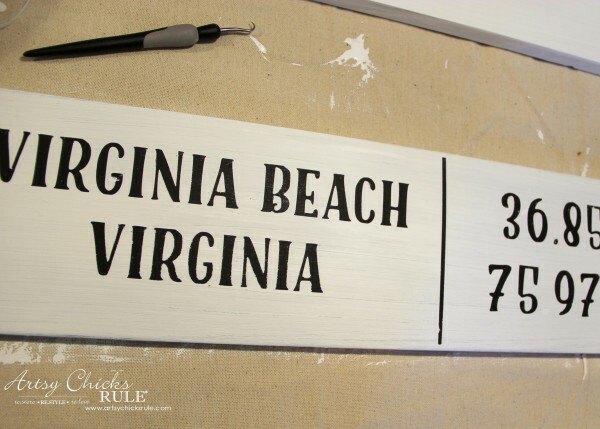 Next, apply white paint right over top of the vinyl lettering. 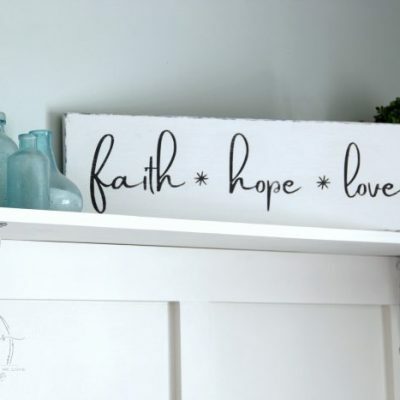 I used Chalk Paint in Pure White. Any paint will do. 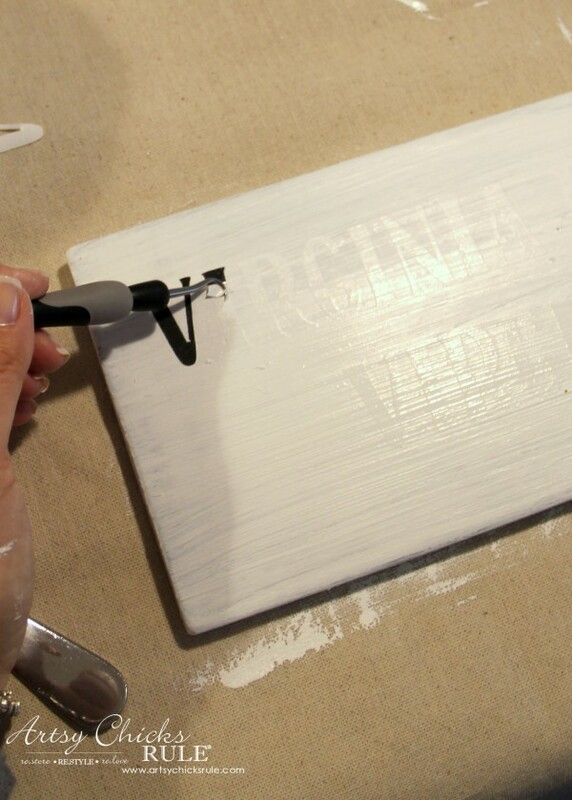 Then before the paint fully dries, carefully remove the vinyl letters. Silhouette has this nifty little tool for this. I do believe it’s included in the bundle I linked above. By the way, I only used one coat of white because I wanted the black to show through a bit. Above photo is before I sanded and distressed. I used a fine grit sandpaper and went over the entire thing. 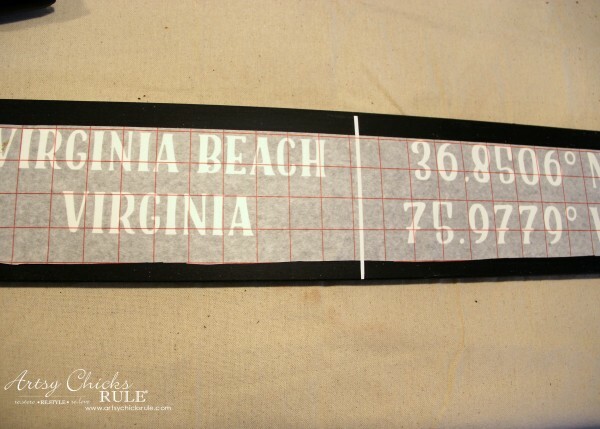 Basically the idea is to soften the edges of the lettering and bring some of the black through for a worn, aged look. After sanding, I applied the High Performance top coat I linked above. 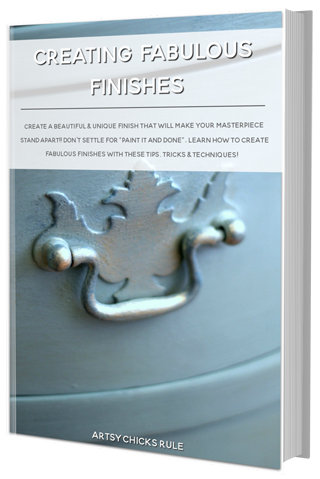 Be sure to wipe away all of the sanding residue before you apply the finish coat. This was a really simple sign. Perfect to make for a unique gift for someone, maybe housewarming, new to the area, etc? 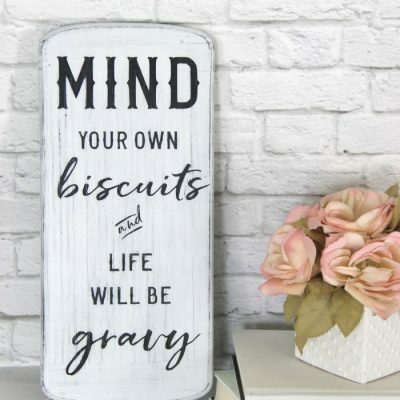 Or even for your own home! Plus, don’t forget to check back in on Sunday to link up your numbered/lettering projects. We want to see them all! 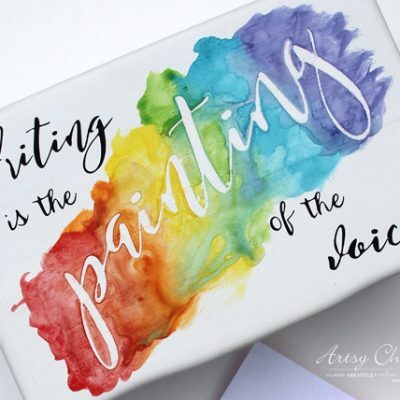 The fun starts on Sunday, February 7th at 7pm EST…..
Or, just stop on by for ideas and inspiration from all who link up their fabulous projects! Haha!!! Yep, you sure can!! :) Thanks!! Okay, this is adorable!! I have to get onto using my Silhouette – you made it look so easy! 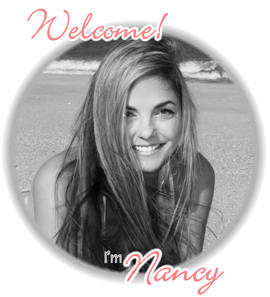 So thrilled that you are joining us Nancy!! This is great, Nancy!! And you can import your creation from Pickmonkey?! Who knew? So glad to have you on board!! Nancy, HOW COOL IS THIS?!?!?!!! 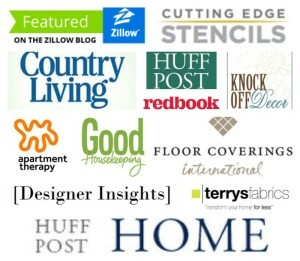 Everything you do always has that creatve “edge” that sets it apart from other similar projects. This is a winner! Thank you so much!! :) Really means a lot!! 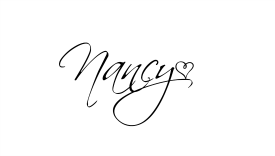 Looks so good Nancy I just came across something at Michael’s yesterday and bought its by Hazel&Ruby, it’s a stencil mask, I just used it last night on a D I Y table for granddaughter. I was watching some utube videos on different things you can do with it, have you heard of them hazel&ruby? 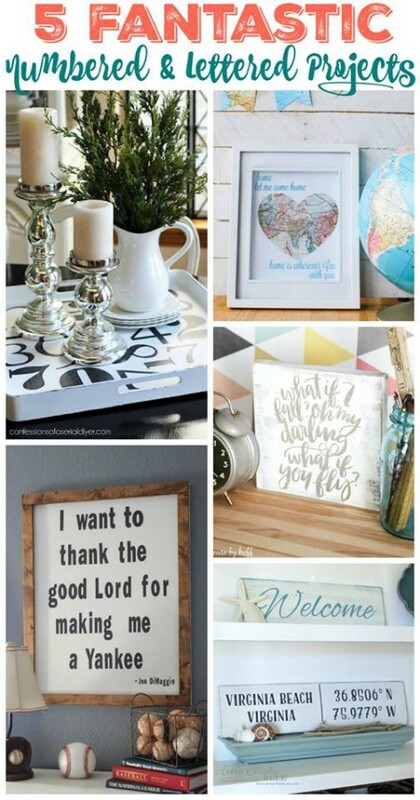 Great diy Nancy!! I love this whole sign thing you have going! 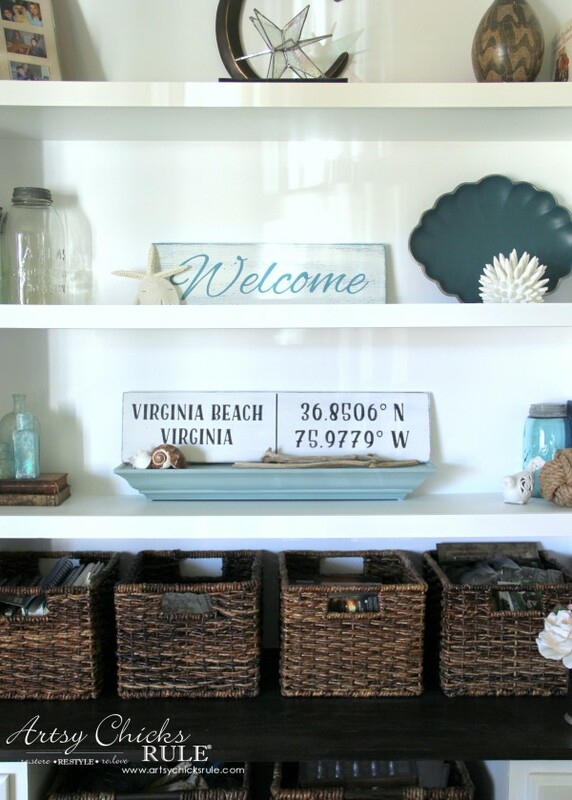 I have always loved signs but never attempted one, until I fell in love with your blog. Now I need a Silhouette! 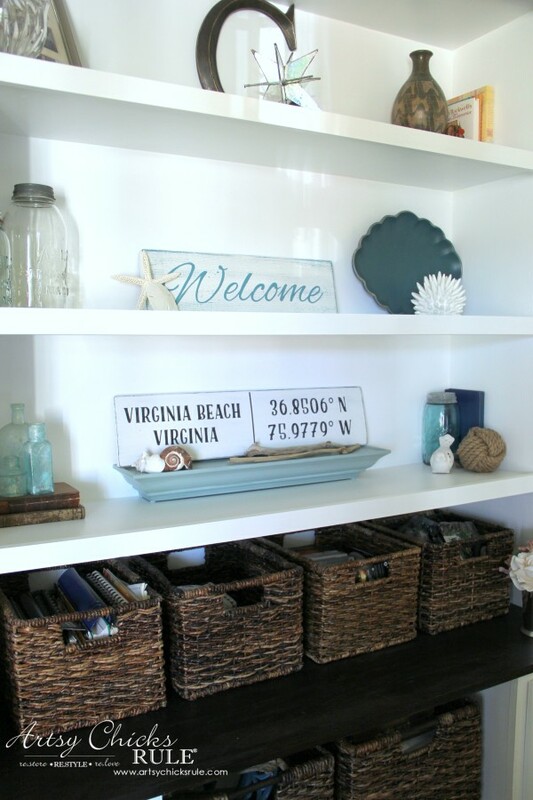 BTW, that blue plate on the shelf, I have one just like it and also painted it blue! Was it a pewter tray? I really love the shape of it! I love the latitude stuff on the sign. That gives it cool edge.. I am having such a difficult time with PicMonkey. I’ve spent days on it and just cannot figure out the pixels, etc. Very frustrating. Love your Coordinates sign!! Aw I’m so sorry! I don’t really mess too much with those particulars when creating signs, etc. Just try going for the shape you want and go from there. 1) The words Beautiful and Blessed and a third word that I can’t see because of popups that cover it. These are in cursive. I realize you posted these last year but is there any way you can retrieve them and email them to me as attachments or, if not, a link that definitely will open them up? I really like these and hope you can help me out. Oh no, I’m so sorry Becky! I can’t imagine why? I don’t have any pop ups so there shouldn’t be any. :( What do the pop ups look like? Do you mind telling me what they say? I think the other one is a pin that isn’t from my site, on my board Creative Ideas. I’m sorry, I don’t know which one that is. 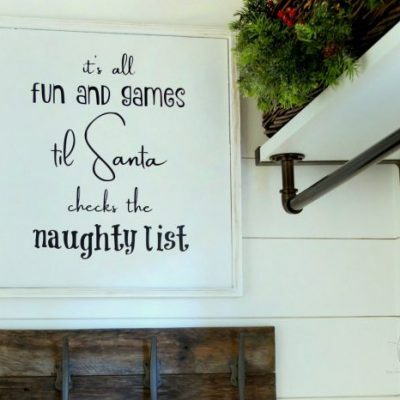 I don’t have a post titled “Decorating with Stencils”. 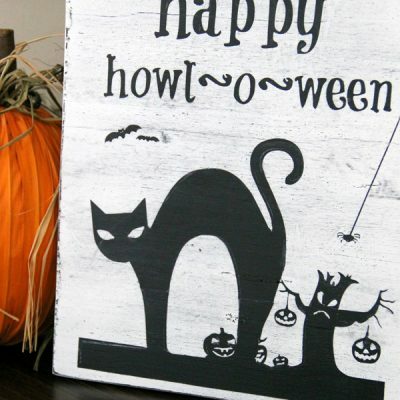 Love this sign!!! 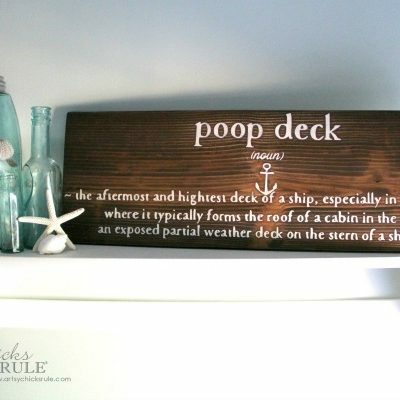 Was trying to find something to make mother-in-law and this is great!!! What font did you use? Thanks Christina! I just searched through my fonts but couldn’t figure out which one I used. I have added so many fonts since then so it’s tough to find! Sorry! BUT I did come across this one that I thought it was because it’s so similar. Search it on google and see what you think. Caferus Basic. Thanks!!!! 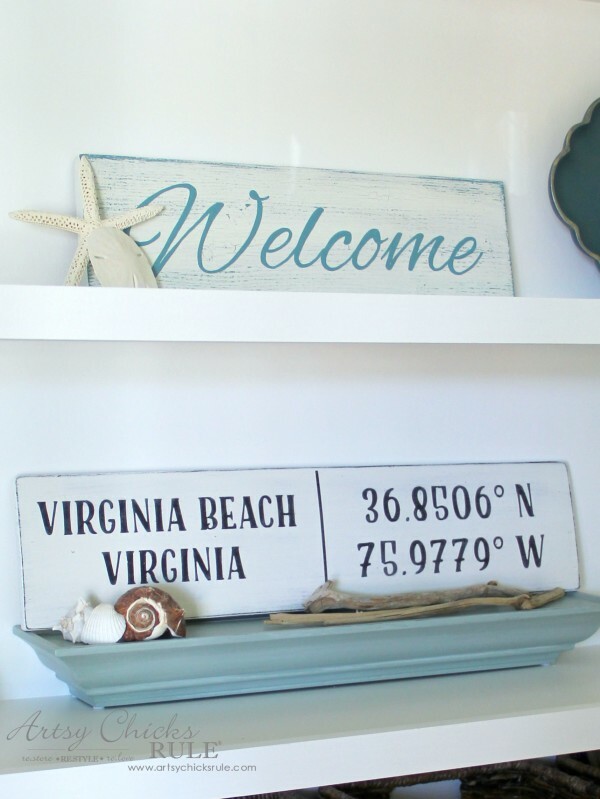 I found some other “beach” font and can’t decide what to use now. Love the blog can’t wait to read more.